Following up on my earlier postings on The Shahnameh of Ferdowsi, (here and here) I return to a very troubling example of the destruction of a "one of a kind" book for profit. The Shahnameh or Persian Book Of Kings, is a masterpiece of Persian (Iranian) literature. First put to paper by Ferdowsi in 1000AD, the most beautifully illustrated version of the epic poem considered a masterpiece of Persian and Islamic illustrated and illuminated book arts, was created in Tabriz between 1520 and 1544, commissioned by the first Safavid king of Iran. It is known as The Shahnameh of Shah Tahmasp. The provenance of the book is well known and has a tragic ending. Shortly after completion of The Shahnameh of Shah Tahmasp, the book was gifted to the new Ottoman Sultan, Selim II and sent to Istanbul around 1568. Amazingly, the book remained at Topkapi Palace until the beginning of the 20th century. The book included 759 folios of text and 258 paintings, the fine paper decorated with splashes of gold. With the end of World War I and the fall of the Ottoman Empire, somehow, The Shahnameh of Shah Tahmasp became part of the private library of Baron Maurice de Rothschild, Paris, who died in 1957. At that time, the American collector and patron of the arts, Arthur A. Houghton Jr, acquired the manuscript from the Rothschild estate. Houghton, Jr. who was a master rare book collector, did a tour of duty as the curator of rare books at the Library of Congress, and was President of the Metropolitan Museum of Arts in the 1960's. 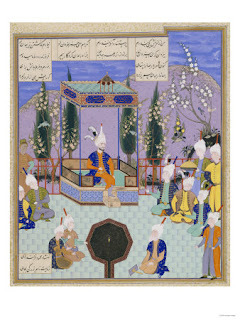 When Houghton Jr., acquired The Shahnameh of Shah Tahmasp for reasons that confound me, he began gifting and selling individual pages to collectors and museums. Upon his death in 1990, only 120 illustrations and the binding of the original remained in his estate and they were sent to auction with an asking price of $20 million, if kept together. The world economy was troubled during 1991 and 1992 and the auction house eventually traded the manuscript to the Tehran Museum of Contemporary Art in exchange for De Kooning's Woman III. Prior to this exchange, individual illustrations from the book were regularly setting records at auction, with closing bids at over $700,000 per page. I guess the case could be made that selling individual pages enabled more Museums and collectors to own a piece of history but I remain disgusted by the destruction of a unique, precious book. Houghton, at least, commissioned the publication of a facsimile of the complete book before he destroyed it. 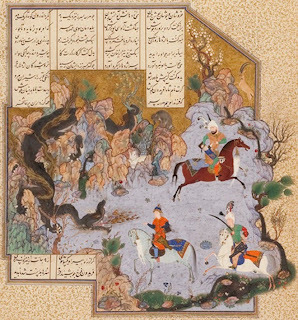 The Houghton Shahnameh was published in 1981 for the Fogg Art Museum, Harvard University by Harvard University Press in two volumes, introduced and described by Martin Bernad Dickson and Stuart Cary Welch. 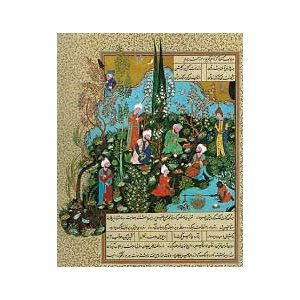 Volume II is a facsimile reproduction of The Shahnameh of Tahmasp. Of the 750 copies bound, 600 copies were offered for sale to the public. Very few copies are for sale at this time and I can identify only three, here and here with prices ranging from $1995 to $4500. A single facsimile illustration was included with each copy of the Houghton Shahnameh with a note suggesting that the separate page was suitable for framing so the facsimile would remain in-tact. I consdier myself fortunate to have a family friend who owns a copy and I am excited to have an opporetunjity to study the facsimile. But I will remain sad about the tragic destruction of the original. At this point, I have to admit that I own various single pages of old books and indeed, 6 are examples of Persian/Islamic illustrated pages. I also own a few single pages of Piranesi pages depicting ancient Rome. In my defense, these pages were separated from the master work years ago, not from priceless editions and in the case of the Persian/Islamic pages, perhaps not even original but printed book pages, aged and colored during the 20th century, one never can be sure! 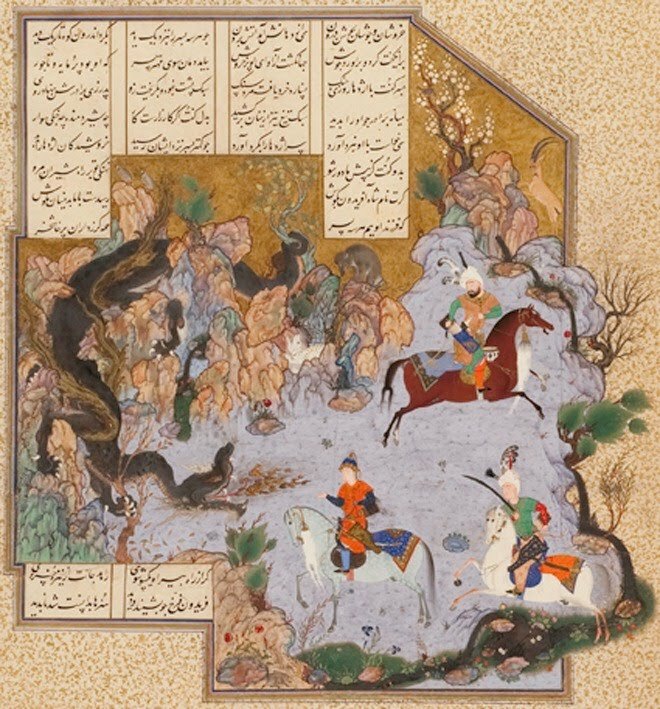 The tragic destruction of The Shahnameh of Tahmasp does cause one to pause and consider the fate of other masterpieces of the books arts, sold in part. I was working at the Metropolitan Museum as an intern when I discovered this book, but I didn't know the whole story. It's sad, but at the same time I think those amazing illustrations deserve to be seen, and that's easier to do if they are out of their binding. When I go to an exhibition and I see a book open by a page, I just can't help but thinking of how much I would love to see the rest of them. Anyway, nice to find your blog.